Start a chain of cafes and strike it rich on this island adventure. "I love a good time management game and Katy and Bob: Safari Cafe is one of them! Good graphics and game play. As you can see from the title, it's based in a café and you're serving customers. You have to prepare the food and drink, along with other tasks like serving four customers at a time or four lots of money consecutively. It's fast and fun and I really liked playing it. These are the type of games I enjoy, and I feel they keep my mind active." Katy and Bob arrived home from their adventures, made up with their dad, and finally started making themselves useful. But one wonderful morning a letter arrived at the family mansion from their friends on the island. In it contained an offer to open up a chain of cafes in the local safari park. After a little deliberation, the whole happy family set off at once to the island to strike it rich. Brace yourself for colorful locations, exciting levels, fun characters, bonus tasks on every level, an upgradable team, all types of trophies, simple gameplay for any age, pleasant music and a captivating plot. The island adventures continue in Katy and Bob: Safari Cafe. I love this game. It was very creative and addictive. I could play it for hours on end. I would definitely recommend it to people. 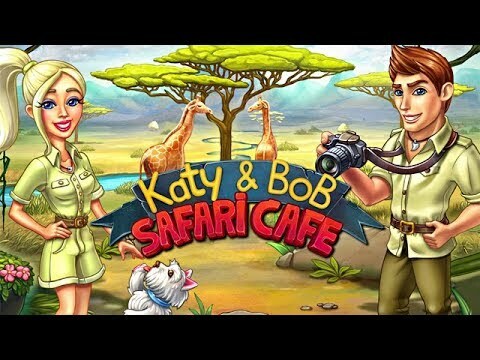 Katy and Bob: Safari Cafe is one of the best games I have ever bought! Lots of fun, easy food making and pretty fast moving. You can buy great upgrades and get the cook moving really fast. I like the whole set up of the food and juice makers. I really enjoy playing this game! I enjoyed playing the first Katy and Bob: Way Back Home, so I decided to try this one and I enjoyed it just as much. I love the challenges this game dishes out. I enjoyed the first one, and loving this one just as much. Ok, maybe a little more. Very fun game. It holds your attention -- doesn't fizzle out but doesn't get so hard it's frustrating. Colorful with amazing graphics. Ready to play again. Great game. Enjoyed the story line and graphics. Would recommend to family and friends! Like the graphics and the game play. Relaxing and entertaining. Like being able to pick upgrades as you play and enjoyed the scenery. This is a fantastic game, love it. I purchased after just a few levels -- knew I would love it. Also bought the first one. Fantastic game, loads of different challenges. it is a better game than Katy and Bob: Way Back Home. Love it! This game is fast-paced and the owners of the bar are the same people, Katy and Bob. I enjoy this game. I enjoyed this game. I purchased it before I even read anything about it. I enjoyed the first one so I just grabbed it. It's just like the first one. Very pleasant and player friendly. Good graphics. Would have loved to have had some interesting twists between levels. This is a fun game if you like Time Management and Simulation games. Cooking food, making juices and more. I love an interesting game and this is one of them. It has good graphics and is just an all-around good game! I'm a big fan of Time Management games and this one didn't fail me! Recommend it. Plenty to keep you on your toes.